Safe365 is an intelligent health and safety solution that assesses or audits any size organization's health and safety program, and helps develop a custom health and safety action strategy. The platform enables users to track improvements, as well as re-assess and develop new action plans to obtain and improve a healthy, safe, and compliant work environment. Once a user completes the initial self-assessment process, Safe365 is able to provide the organization with a diagnosis on their current health and safety status. The dashboard will display the organization’s status across ten critical areas which are mapped to legislation and ISO standards, enabling users to see exactly where the business requires improvements. Users can then prioritize time and resources, and as actions are implemented, improvements are automatically recorded. Reports can be generated in minutes and can be shared with key people within the organization such as directors or senior managers, providing them with the information they need for due diligence, and more. Safe365’s reports visually highlight priority areas of development to ensure organizations meet the legislation, while further enhancing employee safety. As part of the subscription, users can request monthly updates of the most recent health and safety developments to make sure the organization stays compliant. Safe365 also provides organizations with over 300 training videos, templates, and a variety of tools to support their improvement including tracking, reassessments and action plan development. There are currently no reviews of Safe365. Safe365 helps organizations assess their health and safety capabilities, while helping to develop a personalized health and safety action plan or strategy. Develop a compliant health and safety environment with Safe365's suite of features including over 300 templates and tools for improvement. 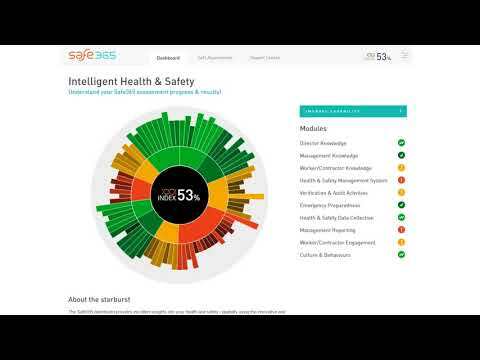 Safe365's intelligent diagnostic tool provides users with a transparent assessment of their current workplace environment relative to the requirements and best practice of workplace health and safety legislation. Safe365's simple visual reports are easy to comprehend and highlight priority areas of development which help make sure that organizations are meeting the legislation while further enhancing employee safety. Get monthly updates of the most up to date health and safety developments included within the subscription to ensure the business stays compliant at all times. Below are some frequently asked questions for Safe365. Q. What type of pricing plans does Safe365 offer? Q. Who are the typical users of Safe365? Q. What languages does Safe365 support? Q. Does Safe365 support mobile devices? Q. Does Safe365 offer an API? No, Safe365 does not have an API available. Q. What other apps does Safe365 integrate with? Q. What level of support does Safe365 offer?